Your body’s most important healing work happens in deep sleep. A toxic and non-supportive sleep surface impairs that healing work. intelliBED is the only mattress I’ve found that sufficiently meets all these criteria. Years ago, I got a new conventional mattress. Within a week, I suffered the worst flare ever of my autoimmune disease. Only later, when I learned the toxic materials used in mattresses, did I connect the dots. I began my search for the safest mattress and discovered intelliBED. If a mattress fails to provide adequate support, the joints sink and the spine cannot maintain alignment. Poor body alignment impairs physiological function, including the healing work of the body during sleep. A mattress which supports spinal alignment allows restorative sleep. You get more “bang for your buck” – the time you spend sleeping is more efficient healing time. If your mattress causes you to toss and turn, it is impairs you from deep sleep. This point also correlates to durability. Many organic mattresses are supportive for a few years, but break down quickly. You may find your sleep quality reduced as your mattress ages. Thank you so much for this post Lauren! My husband and I are planning to purchase a mattress for ourselves and for any future babies we may have, and I just had no idea where to buy a safe non-toxic mattress. I am so thankful for this post, because you did all the searching around and research for me! Do you breathe in toxins from your mattress? Conventional mattresses contain numerous toxic components that off-gass chemicals. These toxins are inhaled during the night, when your face is in close proximity to the off-gassing ingredients. Fire retardants – U.S. mattresses are required to meet extreme fire safety standards, due to lobbying from the tobacco industry decades ago. Common fire retardants used on mattresses off-gass toxic fumes, including formaldehyde. Memory foam – Memory foam is made from chemically-treated polyurethane foam. While polyurethane foam is not an inherently toxic material for sleeping, it becomes highly toxic when it is turned into memory foam. Vinyl chloride – New crib mattresses off-gass a toxic slew of chemicals from the vinyl and fire retardants. The EPA classifies vinyl chloride as a Group A carcinogen. Thanks for sharing! Your info lead me to buying one. We needed a new bed for so long but held back because I didn't want to breathe in all the toxins of a new mattress. So excited to finally have a supportive mattress again that is high quality and non-toxic! After researching various options and multiple conference calls with the founders of this company, I decided to go with intelliBED when I made the transition to a non-toxic mattress. Patented intelliGEL redistributes pressure so well that it’s used in hospitals for bed-ridden patients to prevent bedsores. intelliGEL is made with mineral oil and is not considered an organic material. But it is completely non-toxic and inert as a mattress component. I certainly wouldn’t eat mineral oil (or use it on a baby) but I confidently sleep on it. 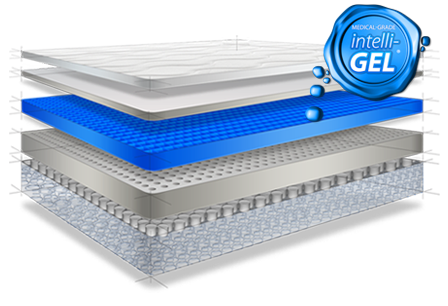 intelliGEL won’t foster microbial growth, like mattresses made with only natural materials. 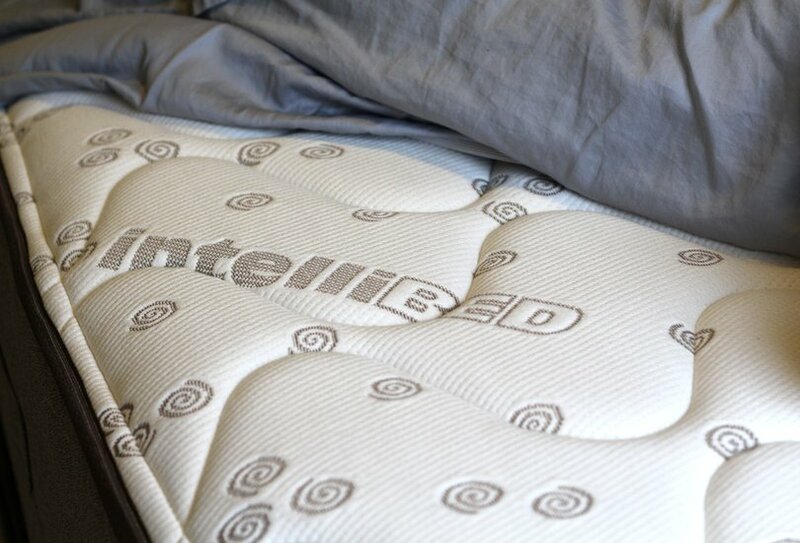 Like all mattresses on the market, intelliBED must meet flame-retardant industry standards. They use an inert, non-offgassing mineral fireblocker. They have never had a customer report an allergy or reaction to their mattresses or components of their mattress. The springs are important to help provide the support of the mattress. PU foam is a safe and inert substance for mattresses, as long as it is not treated with chemicals to make it fireproof or to turn it into memory foam. The foam is free of toxins like phthalates, formaldehyde, and heavy metals. It is very low VOC, at .5 parts per million (.1 ppm is considered safe). I’ve also visited the company headquarters and toured the manufacturing room. The following is a Volatile Organic Compound (VOC) meter, which measures airborne pollutants. 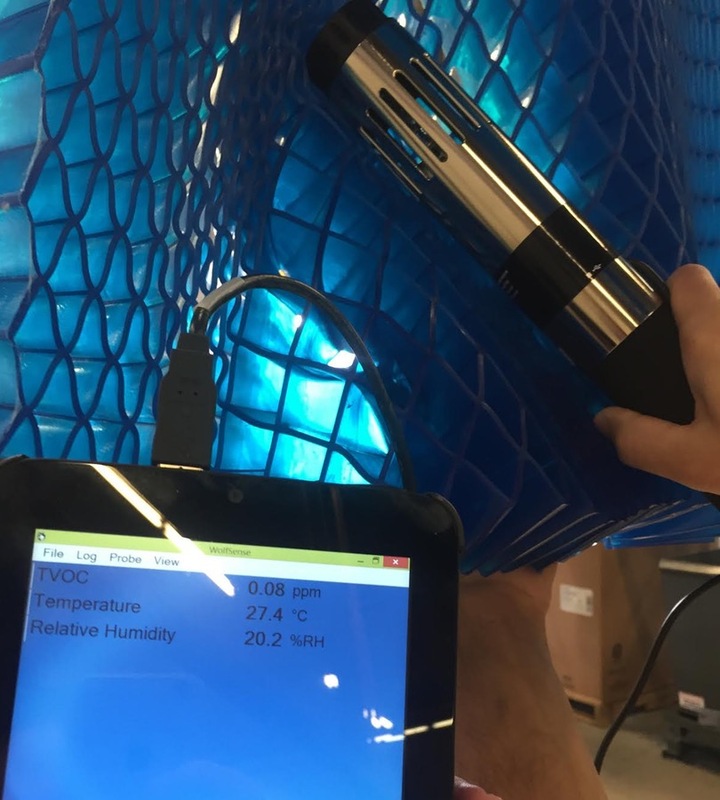 The measurement is taken in the manufacturing room, as the intelliGEL is coming out of the mold. It shows .08 VOC, and anything under .1 is considered excellent. Browse the website for mattress models, then call intelliBED to place your order. The representative will ensure you have the right mattress for your needs. Tell them Lauren sent you to receive 10% off. Experience your mattress at no risk with their 90-day money back guarantee, and 30-year warranty.